Knit Construction Keeps You Cool And Warm In Fall & Winter. 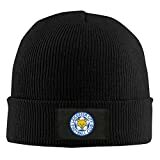 Leicester City F.C. Football Black Fashion Ski Hat Soft And Warm Wool Fibers,Perfect Winter Sports Accessory.